What Day Of The Week Was October 14, 2006? 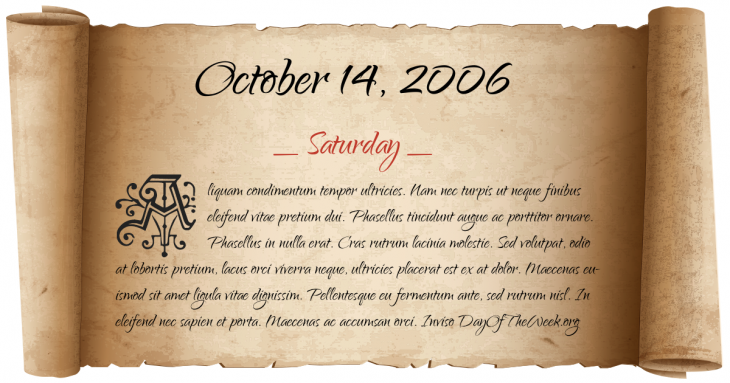 October 14, 2006 was the 287th day of the year 2006 in the Gregorian calendar. There were 78 days remaining until the end of the year. The day of the week was Saturday. A person born on this day will be 12 years old today. If that same person saved a Penny every day starting at age 6, then by now that person has accumulated $23.79 today. College football brawl between University of Miami and Florida International University leads to suspensions of 31 players of both teams.